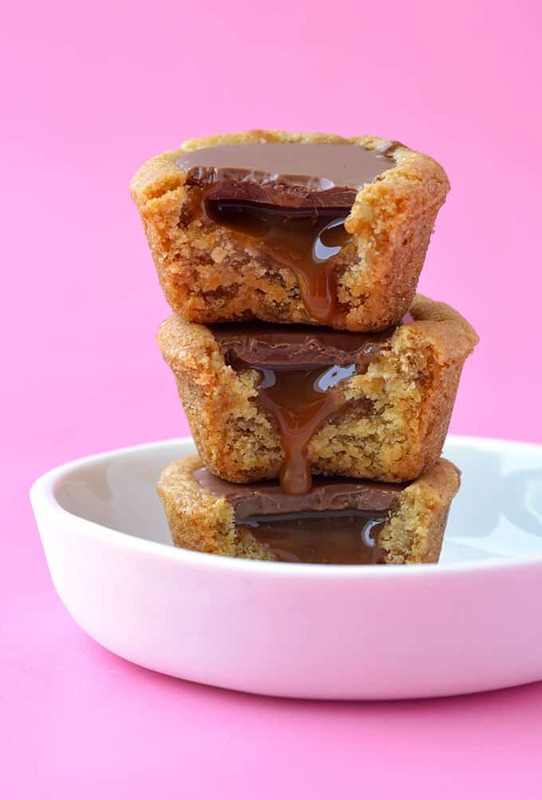 Buttery Twix Cookie Cups made from scratch. 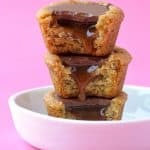 These cookie cups are made in a mini muffin pan and filled with caramel sauce and creamy milk chocolate – and they taste JUST like the real thing! I’ve been making these tasty little morsels since 2015 and they’re still one of my all-time favourite things. 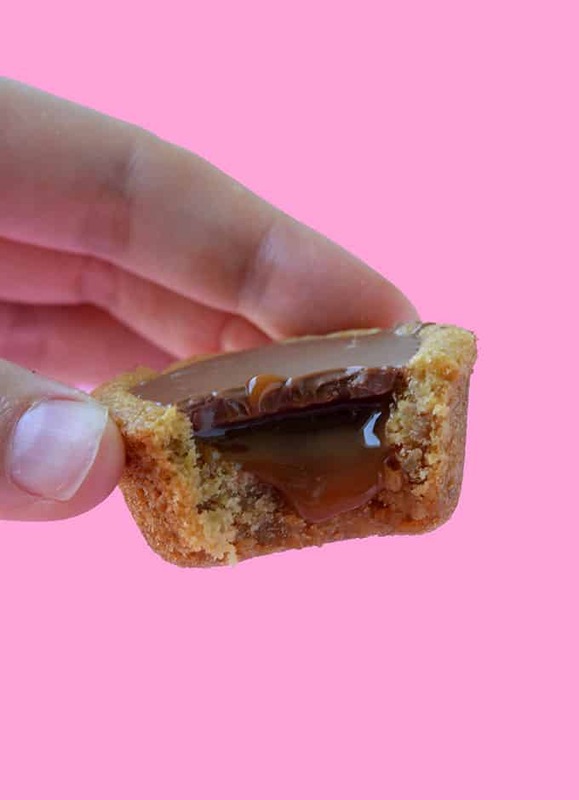 Buttery homemade cookies filled to the brim with gooey caramel and topped with milk chocolate – JUST like a Twix Bar. If you love crumbly cookies, rich caramel and creamy chocolate, you’ll want to eat these forever. 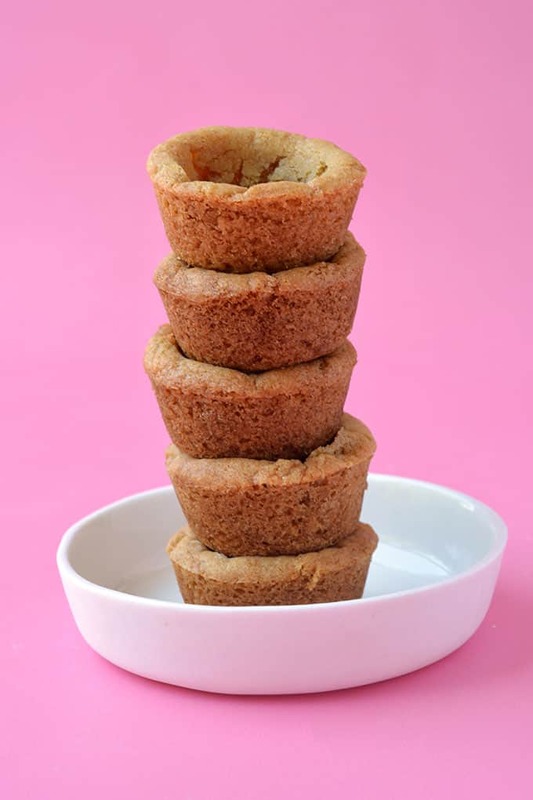 Have you ever made cookie cups before? They’re so much easier to make than you’d think. All you need is a mini muffin pan and a little bit of patience. Once they cool, they can be filled with all kinds of delicious delights. 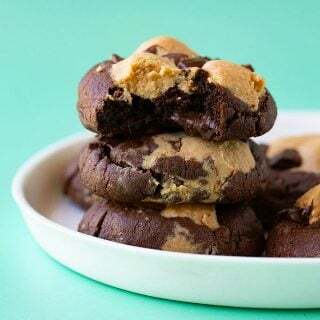 I’ve even made chocolate ones and stuffed them with cookie dough (find them HERE). It is no secret around here that I love Twix bars. In fact, we’ve made a number of Twix-inspired recipes, from Twix Ice Cream to Twix Slice and Bake Cookies. There is something magical about the combination of homemade cookies, golden caramel and milk chocolate. 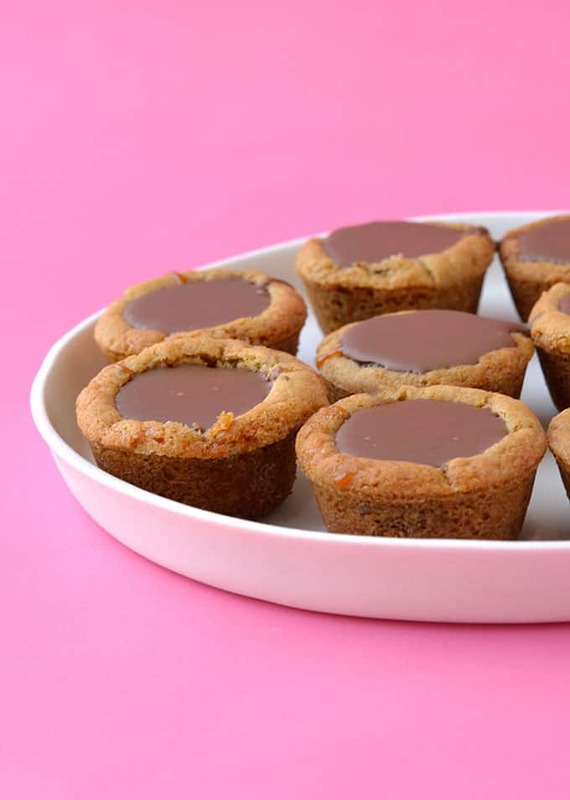 So if you want a buttery, moreish and oh-so-sweet treat, you’ve got to try these Twix Cookie Cups. My recipe makes 20 cookies, so it’s the perfect choice for a party or when you’re entertaining a crowd. Make a batch and watch them disappear! The cookie recipe is slightly different from regular cookies, with a little less butter. The cookie dough also requires chilling – don’t skip this step. It’ll ensure the cookie cups have the right structure. 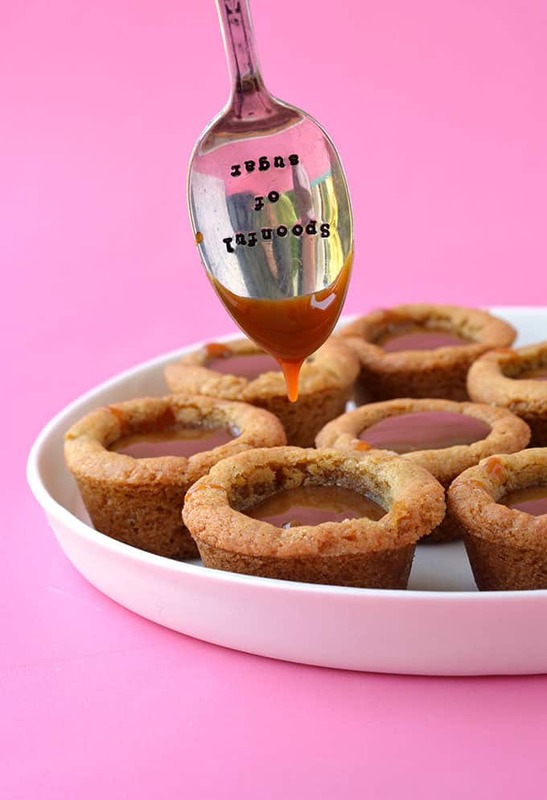 After they bake, the cookie cups will be fragile and even appear soft. And they will have puffed up quite a bit – that’s ok. Gently reinforce the hole using a rolling pin when they coming out of the oven. Then leave them in the baking tray for at least 10 minutes before gently removing them to a wire rack where they can cool completely. You can use homemade or store bought caramel. And any milk chocolate will do. Store the cookies in an airtight container and only fill them when you’re ready to serve to prevent them from going soggy. 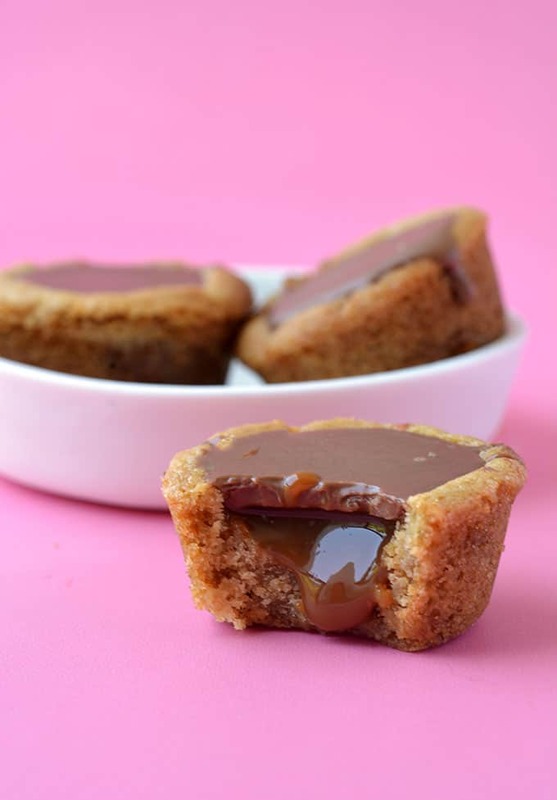 Golden baked cookie filled with gooey caramel and milk chocolate, just like Twix bars! In a large mixing bowl, add butter and sugars and beat with an electric mixer until combined. Add vanilla and egg and beat until mixture is creamy and smooth. Sift in flour and baking soda and stir using a wooden spoon or spatula. Cover with plastic wrap and chill cookie dough for AT LEAST 1 hour. Grease a mini muffin tin with butter or a quick spray of cooking oil and set aside. Preheat the oven to 180 C (360 F). Using your hands, roll level tablespoons of dough into small balls and place each one into mini muffin tin. Continue until you run out of dough and have filled approximately 20 mini muffin holes. Gently press down so the dough fills the cavity and has a flat top. Then grab a rolling pin dusted with flour and press down and twist on top of the dough to create a hole or cavity in the middle of each cookie. Place tray in the oven for approximately 8-10 minutes or until cookies turn golden brown. At this point, the cookies will have puffed up quite a bit, so grab your rolling pin again and very gently reinforce the hole in the middle of each cookie. Leave to cool for 10 minutes. Then gently remove the cookies from the tray and place them onto a wire rack to cool. It’s ok if the cookies appear really soft, especially in the middle, as they will firm up when they cool. 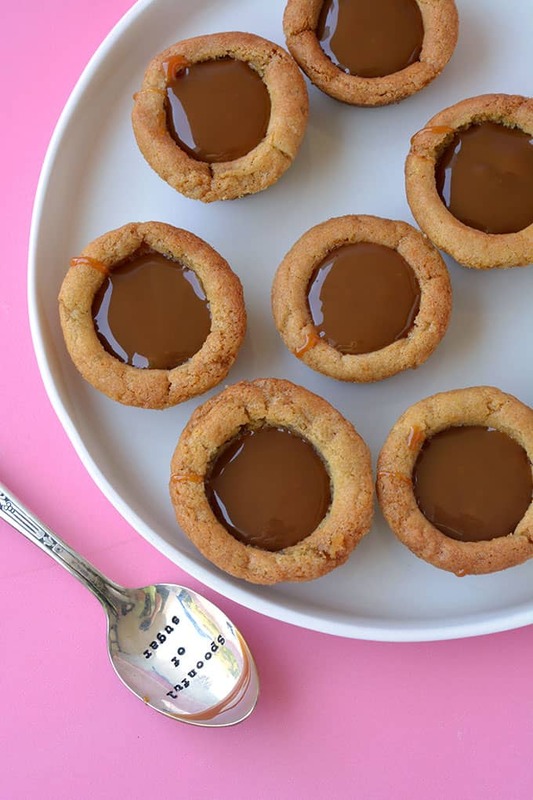 Once the cookies have cooled, spoon a teaspoon of caramel sauce into each one. Melt the chocolate in the microwave and then spoon a teaspoon of chocolate over the caramel. Leave chocolate to set. 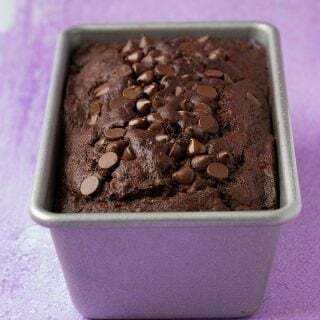 Once you have added the filling, these cookie cups are best enjoyed straight away but the cookie cups themselves will keep for at least three days in an airtight container. 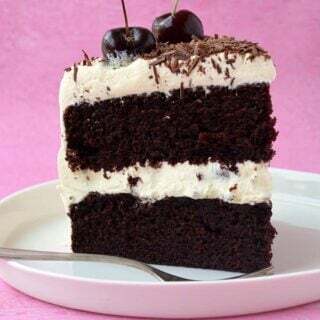 This recipe was first published on Sweetest Menu in January 2015. Made these today, can’t wait to try them! These look absolutely incredible! Your photography is beautiful!